We investigated the frequency and causative taxa of observed microalgal blooms in New South Wales (NSW) coastal waters from 2000 to 2009 and compared these to an earlier bloom inventory from 1990 to 1999. The majority of recurrent blooms are harmless water discolourations caused by Noctiluca scintillans and Trichodesmium erythraeum. The recent reporting period witnessed the fi rst blooms of Astrionellopsis glacialis, Guinardia sp., Skeletonema sp., cf. Heterocapsa sp., Dinophysis caudata, Prorocentrum dentatum, Prorocentrum rhathymum, Fibrocapsa japonica, Gymnodinium catenatum, Oscillaroria sp., and Anabaena circinalis. The frequency of blooms appears to have increased over time with a shift in maximum bloom activity from January (1990 to 1999) to October (2000 to 2009). Peak bloom years correspond with El Niño episodes, the most significant being 1997 to 1998 and 2002 to 2003. No significant difference was found between the causative species or spatial distribution of dominant taxa over two decades. 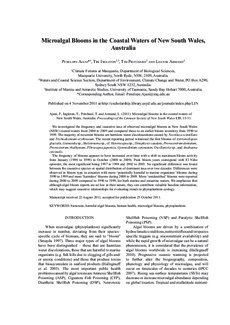 Differences were observed in bloom type in estuaries with more ‘potentially harmful to marine organisms’ blooms during 1990 to 1999 and more ‘harmless’ blooms during 2000 to 2009. More ‘unidentified’ blooms were reported during 2000 to 2009 compared to 1990 to 1999, for both marine and estuarine waters. We emphasize that although algal bloom reports are ad hoc in their nature, they can contribute valuable baseline information, which may suggest causative relationships for evaluating trends in phytoplankton ecology.